Planting strawberry plants in the fall is a good idea. However, most home gardeners get excited about their gardens toward the end of the winter months and don’t plan far enough ahead to plant strawberries during the autumn months of the previous year. 1. Most home gardeners miss out on a healthy crop of strawberries during the first year (growing season) they are planted. 2. It is harder to find strawberry plants for sale in the fall months simply due to supply and demand. Demand is much less, so supply is much less. 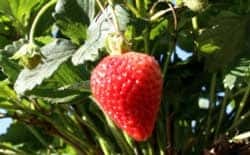 This post is for those people looking to plant strawberry plants in the fall so that they can reap a healthy harvest of strawberries during the gardening season the following spring/summer. Below you will find some helpful reminders and information, as well as a list of suppliers who offer fall strawberry plants for sale. Planting strawberries in the fall makes much sense. It makes so much sense that commercial strawberry farms almost exclusively plant strawberry plants during the fall months after they have harvested the previous year’s strawberries. If you plant in the spring (as most hobby gardeners do), much more care is required and much more time passes from the time the strawberry plants are planted until a full harvest is reaped (see the Growing Strawberries page for more information). By planting a strawberry bed in the early fall months, the strawberry plants are able to fully establish themselves and their root system prior to going dormant for the winter. Then, as the temperatures rise in the late winter or early spring months, a fully-rooted and more mature plant begins to put forth new foliage and flower stalks. Instead of pinching off the strawberry flowers so that the roots can establish, the already-established roots pull water and nutrients from the soil to support the growing strawberries. This allows a healthy harvest during the first growing season instead of the second! Additionally, most mail order nurseries will ship strawberry plugs with intact roots for fall planting. This helps the plants establish more quickly than bareroot plants and helps minimize the number of plants that die (more plugs survive than do shipped and planted bareroot plants). Hopefully, those strawberry gardeners with an inclination toward planning will realize the benefits of planting fall strawberry plants. The next step is to find out where one can buy fall strawberry plants. Keep reading! This list of suppliers who offer fall strawberry plants for sale is a smaller sub-directory of our main directory. 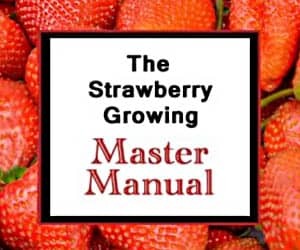 If you happen to find this list during the spring months, be sure to check out our much larger directory of suppliers here: Strawberry Plants for Sale. Also, if you are aware of another supplier who sells fall strawberries, be sure to let me know, and I will include them in this directory. You can use the About page to send a message. Remember, plant inventories are usually a bit transient as plant stock is sold out and replenished or replaced with other, better-selling varieties. So, if you find that some of the varieties listed above are no longer offered by the companies/nurseries, please notify me, and the list will be updated. Planning ahead and planting ahead can make a tremendous difference with the quality and quantity of your first strawberry harvest. Why not consider buying and planting some fall strawberry plants instead of waiting until the spring?! As long as they are protected during the cold months, they will do fine. See this for more. Good luck! You did not mention adding fertilizer to fall planted strawberries. I have a new bed and have done a soil test. Everything is good. I did put on a little lime already and am ready to plant. Fertilizer? This should help! Good luck! It has been an unusually warm fall so far in south Mississippi, and they not predicting it get get cold anytime soon. We planted 1500 chandler and 500 camarosa plants. Usually they would be dormant by now, but we have blooms/green berries everywhere. Would it hurt my spring harvest to go ahead let the berries ripen now and get an early crop, or should I pick all the blossoms off? I am also worried my plants are going to be to large this spring if they don’t go dormant soon. Is there anything that can be done about that? Even though it has been warm, the decreased amount of sunshine during the winter months will cause smaller berries even if it stays unseasonably warm. I’d recommend going ahead and snipping off the berries unless you want to try and beat the cold (which will eventually come). If you do want to try and get a harvest, you may be able to if it does indeed stay warm. As far as large plants go, all the vegetative tops will eventually die back when the weather finally breaks, so I wouldn’t worry about that. Good luck! My fall planted berries are thriving in northern Baltimore county. Should I remove blossoms? Also, I grow in these pyramids. When and how deep should I mulch? I am unsure of zone,we are located southern middle TN just above AL line. After reading your site to confirm spacing, I am now concerned of prior gardening at location prior to bed area selected site in relation to disease . I am now prepared to plant my ozarkbeauty plants in matted row system of full sunshine. I have mixed organic material along with peat moss in bed, and we have had our first freeze already. What can I do post to protect from disease come spring ? Am I safe in planting now? What suggestions might you offer? It is later than usual for planting, but you will still probably be okay in your location to get them in the ground. Regarding disease, I’d reference the Library for specific help if you encounter problems. Good luck! We have hoops with row cover for our strawberries. Would it harm them if i put the row cover on at night. Its been in the 50’s 60’s here. I want to protect them from the deer. Putting the row cover on at night should be fine as long as it isn’t exceedingly heavy. Good luck!